Transmission Electron Microscopy (TEM) is an invaluable tool for the characterization of solid (crystalline) materials at nano- and sub-nanomete scale. It allows a wide range of imaging and diffraction techniques that provide information on elemental composition and atomic structure down to a single atom either by scanning [(S)TEM] the electron probe across the specimen or pointing it directly onto defect domains. In the latter case, imaging, for instance, of point defects, grain boundaries and hetero-phase interfaces can be obtained. STEM can be used to examine specimens to acquire information, particularly on microstructures, atomic arrangements within crystal structures, and, by using a high-angle annular detector, atomic number contrast. Energy dispersive X-ray spectroscopy (EDX) exploits X-ray emission from the excited atoms to obtain submicrometre elemental identification and compositional analysis. The addition of Electron Energy-Loss spectrometer (EELS) and Energy-Filtered (EF) imaging techniques allows for the detection of chemical elements at greater spatial resolution, phase identification, and information on valence state, coordination and bonding environment of atoms forming the phases. The brightness of the STEM probe, i.e. the number of electrons per unit area per unit time, substantially exceeds that of third-generation synchrotron sources, making the technique a powerful mean for analysing electronic structures and identifying impurity species or dopants within nanostructures. 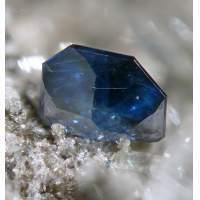 After an overview of the above-mentioned techniques, some case studies on minerals are illustrated.